Boyles Orthodontics creates beautiful smiles, but retainers are always needed to maintain that smile. Patients typically wear the retainers full time for approximately one year after getting their braces or aligners removed. Patients are then instructed to continue wearing their retainers at nighttime. The most common problem with retainers is losing or misplacing them. 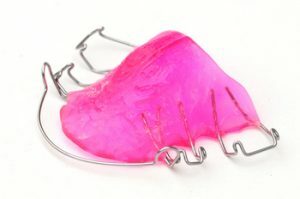 This type of retainer is made of bendable wire and acrylic or plastic. The wire goes across the front of your teeth, and the acrylic is molded to fit perfectly inside your mouth. Hawley retainers are available in a large variety of colors. This type of retainer is adjustable so that your orthodontist can “tweak” your teeth a little bit after braces. This type of retainer is made of molded clear plastic and resembles an Invisalign aligner. People like this type of retainer because it is less noticeable than a Hawley retainer. Essix retainers also have a shorter lifespan than Hawley retainers. On average, they begin to wear out after a few years, and then need to be replaced. This retainer stays in your mouth all the time, because it is bonded (glued) to the back of your teeth. 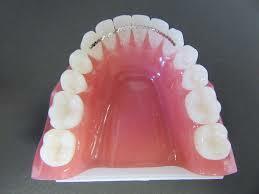 Usually this type of retainer is placed behind the six front lower teeth. It can be very difficult to floss the teeth which are bonded; you will need to use floss threaders to do it correctly. Patients can tend to build up plaque and tartar around this type of retainer if good oral hygiene is not maintained.